A syringe and some kind of stand makes it easier. You want to make a stable droplet of water hand off the end of something, if you have a syringe this is quite easy, but you should be able to achieve the same effect using a piece of string, or another object. 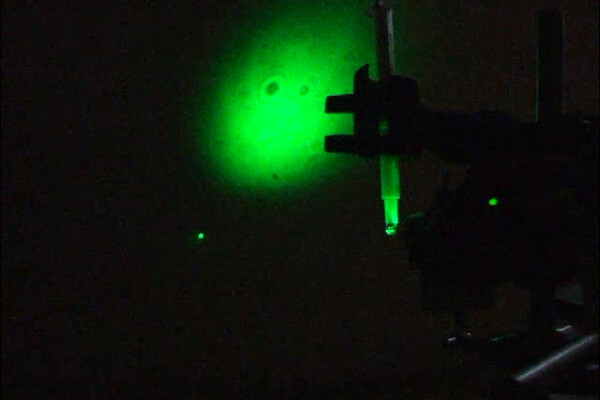 Shine your laser pointer through the droplet onto a white surface, and watch. You should see shadowy patterns projected onto the screen, most will just move with the flow of liquid, but some zip around on paths of their own. One way in which laser light rays are special, is that they can be made to travel parallel, this means that shadows cast by a laser have much sharper edges than those from a normal light (where the light is coming from a variety of different directions so you are actually seeing lots of different shadows on top of one another). This means that a shadow created by a tiny creature inside the droplet will still be visible several metres away. Normally you wouldn't be able to see the shadow as it would be so small, but the droplet focusses the light to a point like a lens, and then the light spreads out behind the drop. As the light spreads out the shadow spreads out too, and gets hugely enlarged. The closer an object is to the focus, the more light it will block so the bigger it will appear, this is one of the reasons that the blobs which appear to be further back are also smaller. You can see objects which aren't actually opaque like small creatures, as they tend to be full of sugars and salts, so they will act like an extremely weak lens. This will cause the light to come to a focus slightly earlier and spread out more than the light which didn't hit the creature, forming a dark area surrounded by slightly lighter area. interfere with one another producing the ring patterns you see. This effect is very related to the 'floaters' you see when you look at a uniform bright surface, which are cells, and bits of stuff floating around in your eye, but they are much closer to your retina, so the light hasn't come to a focus yet, and you tend to see a dark ring with a brighter centre.